The Detroit branch of a national nonprofit utilizes 123Net’s services to support two locations. Goodwill Industries of Greater Detroit needed a solution for one of their stores in a low-infrastructure setting and a backup service at their headquarters location. Goodwill Industries of Greater Detroit, the original social enterprise, supports more than 900 local businesses each year. Their revenue-driven businesses, Goodwill Industrial Solutions, Goodwill Green Works, Donated Goods Retail, as well as contract and placement services, allow Goodwill Detroit to provide best-in-class employment and training programming to residents throughout metro Detroit. Classroom and vocational instruction paired with transitional work experience puts Goodwill Detroit trainees in high demand. Program participants also receive workplace behavior coaching, financial literacy, placement assistance, and career support. Goodwill Detroit leads from its mission of co-creating independence and dignity through the power of personal and workforce development. Mark was committed to finding an internet service provider that could help Goodwill Detroit manage the store’s needs and provide access diversity for their headquarters in the event their primary circuit was compromised. 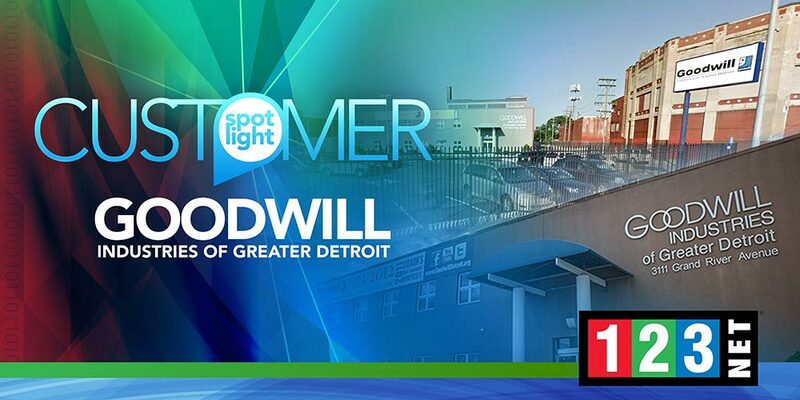 With 123Net, Goodwill Detroit was given a solution with one provider addressing both of their concerns. 123Net’s Fixed Wireless isn’t reliant on the high-cost infrastructure that other providers needed to build Goodwill’s Livonia store, making turn up easier and more cost-effective for the nonprofit. This same infrastructure style, reliant on microwave technology, was completely separate from the primary circuit Goodwill Detroit had at their headquarters, making it the ideal backup for their network. 123Net is making it easier for Goodwill to support the Metro Detroit community, “We have more options with 123Net because they offer end-to-end solutions and scale with us as we grow. Since we first opened, our need for internet access and VPN access has increased and we’ve become more in-depth with our cloud-based application usage. Having the kind of bandwidth 123Net provides has made a huge difference in how we operate,” according to Mark.